One of my deepest desires when I am in my younger days is that, when I grow up I wanted to be a nun. And a friend of mine wanted to be a nun too! 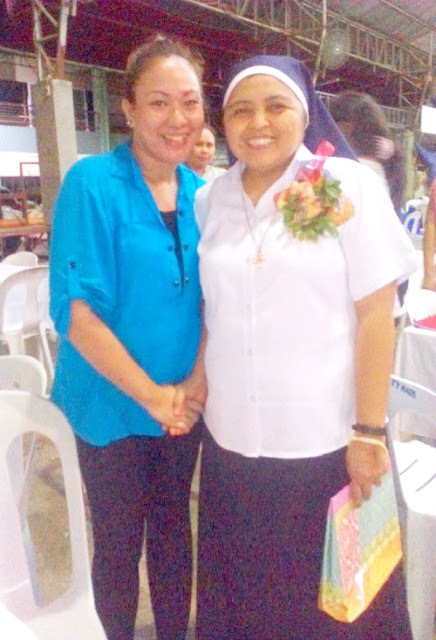 Looking back over the years, studying in a Catholic school run by an FMA (Daughters of Mary of the Assumption) sisters, we are certain of becoming like them -- a Nun (Assumption sisters that time is still under the FMA congregation before they become Missionaries of the Assumption or M.A). 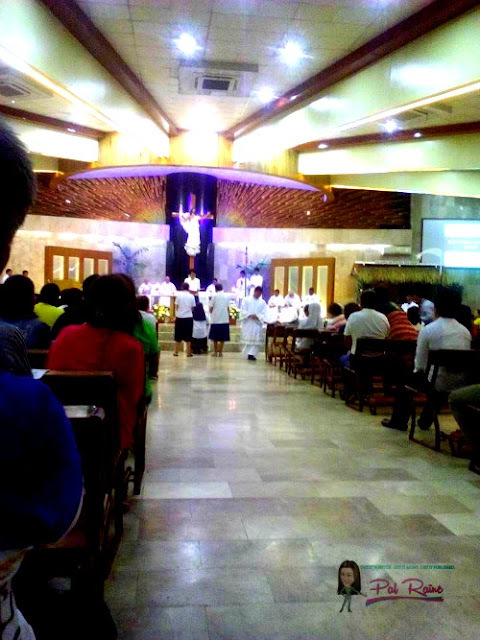 As part of the Catholic culture that formed us, we had deep love and devotion to God and Mama Mary. But, as time goes by my desire suddenly change., as I think it more, I have a doubt and try to question myself -- IS GOD CALLING ME? To what way of life is God calling me or if He is just directing me to do something to serve His people in another way. Are you willing to serve wholeheartedly? Do you have a Catholic Value that you can help contribute to the community your going to serve. The steps in entering a Religious Community are less familiar than steps in getting for married life. I for sure knows what are the steps in getting married, get marriage license permit, go to register your name as couples and have a license priest to preside your wedding. 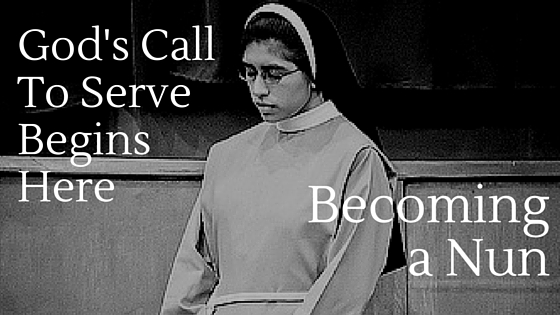 To become a nun, you need to engage in the act of discernment. Which means "DIS" to apart and "CERNERE" meaning to sift. And that means a practice of sifting apart. 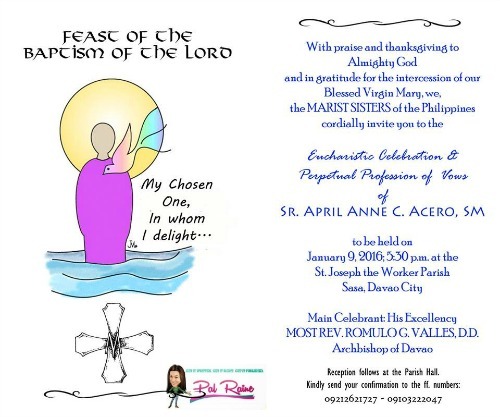 I was invited by the Marist Sisters of the Philippines to attend and witness the Eucharistic Celebration and Perpetual of Vows of my Childhood friend and Classmate. So blessed to witness her fulfilling her dreams and desire to serve God and His people. As I entered the church, I have moment of silence, recollecting all the memories we have from childhood to a teen's life. I don't want to cry, but the tears fall down my eyes. And I said, "You made it and I am proud of you!". Officiated by Rev. 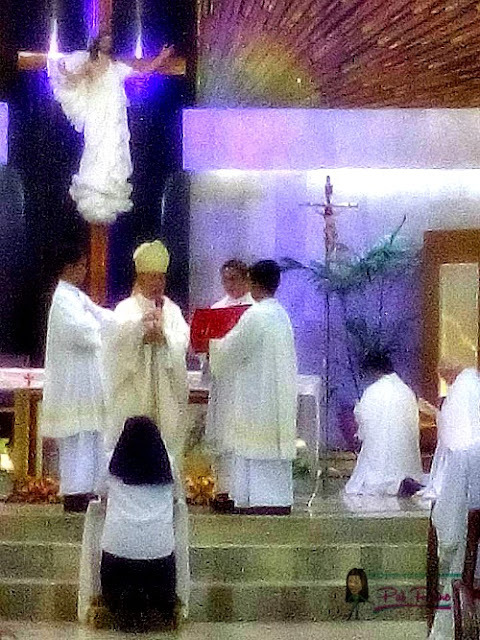 Archbishop Romulo G. Valles, D.D. To give God everything is not so easy. Living in a simple life, great joy and peace of mind, having a little but seeing her very happy with her devotion and service. To give the desire of her heart. To give God everything, not just a theory but truly. Indeed it is a beautiful life, but it wasn't for me! Congratulations on becoming a Nun my friend. Wishing you fulfillment in your service to the Lord God Almighty. I'm really inspired whenever I read about people who find their true passion and calling from God. It's not easy to be a nun, and this friend of yours seems dedicated to share God's word and help others. I wouldn't call myself a religious person, but I make it a point to talk to God as much as I possibly can. Never did I think about becoming a nun though. Congratulations to your friend, we have another faithful servant of God and that's amazing! While I'm religious, I've never thought of wanting to become a nun. But I dream about being able to be influential enough to help more people to do good and contribute to the society! Congrats to your friend! It wasn't easy choosing the path to the Lord, but she made it! I am always amazed at how people of Faith are truly unstoppable. Share the Word! Congrats again! A couple of my high school classmates also became nuns. I have to say that they are not really the first ones I would have thought of who would become nuns. There is really that special calling -- a personal call from God. I have a friend who ended up being a priest. It's really a part of their calling and their mission in life. Informative post. You have to be truly committed to the duty to become nun. Sure is quite the process. I highly respect these people for following not only their hearts but the calling of God as well. Thank you for sharing this post. Wow, I've never actually thought about becoming a nun having a process and all, aside from the usual idea that you just enter the convent. THanks for sharing your friend's story and ceremony! I think it's great if you want to be a nun! It definitely takes commitment. Thanks for sharing.